A tattoo chair is more than just a random piece of furniture. It’s your easel. And it’s probably one of the most important—and expensive—purchases you’ll make for your business. It’s an investment in your business and your craft. It makes sense to choose one that will last for the long haul. 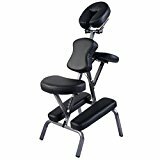 The Best Choice Products Tattoo Chair is a great value for the price chair. It also includes a table with a welded steel and non-slip feet for stability. Versatility describes this chair to a T.
The chair has an adjustable back, and footrests along with removable armrests and head cushion. We also liked that fact that it reclines. It’s a decent starter package that offers a lot of features that a tattoo artist can appreciate. And speaking of artists, we loved the fact that it included a hydraulic stool. No more bending over and killing your back in the process. The cushioning is nice for the client, but we appreciated the attention to detail for the artist too. Share the love! InkBed is one of the most well-known manufacturers in the business. We were impressed from the outset by a company that offers a 1-year warranty on all its products. 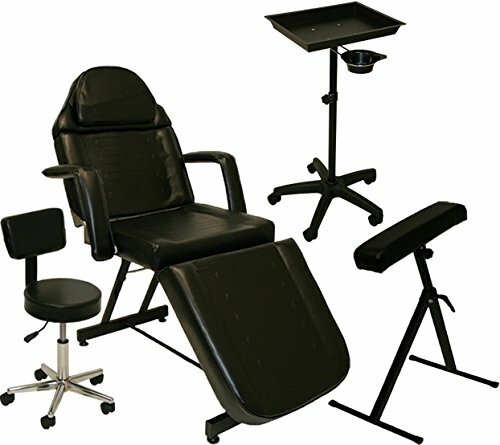 The InkBed Tattoo Hydraulic Ink Chair is a higher end product for the larger shop with more to spend. 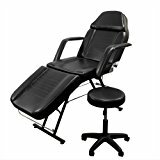 Unlike the Inkbed Chair later down the list, you can use this Tattoo Chair in reclining positions. It is the most expensive of the products that we reviewed. However, it also has ​more features than any of the other ​models we considered. We think you’ll like what you see. It is a professional quality chair. Like the previous one, you can position this chair into just about any position for any tattoo job. You can adjust the height to what works best for you. You can also spin in 360 degrees. It is a product that has both the client and the artist in mind. You can extend it 83.5" long, making it the largest chair we considered. It addresses the issues of stability with no-slip rubber base feet and solid construction to make you feel secure when using it. It is worth the investment for a quality product that will make you work more efficiently. TheGiantex Portable Tattoo Chair is the only travel option among our picks. But we wanted to be versatile too. It’s an excellent option for smaller jobs where you don’t need a lot of space. At 20 pounds, it isn’t a pain to lug around. It includes a travel bag to make moving easy. Even though it’s portable, it’s not short on features. Everything about it is adjustable so that you can fit the job. It has 2” high-density foam padding that we especially liked in the face cradle. We’ve seen many chairs with just an opening, but we like the extra comfort of this chair. Don’t be fooled by its compact size. You can adjust the height up to 47”. With a weight capacity of 350 pounds, it has the durability to back up its comfort features. Not everyone will need a portable chair, but it’s an excellent choice for a small shop or if you have a limited budget. The first thought that came to our minds with this chair is that it looks comfortable like an armchair. We’d have no problem sitting for a tattoo in this one. The company bills its products as ones created by artists for artists. And we can see why when we consider the little things. 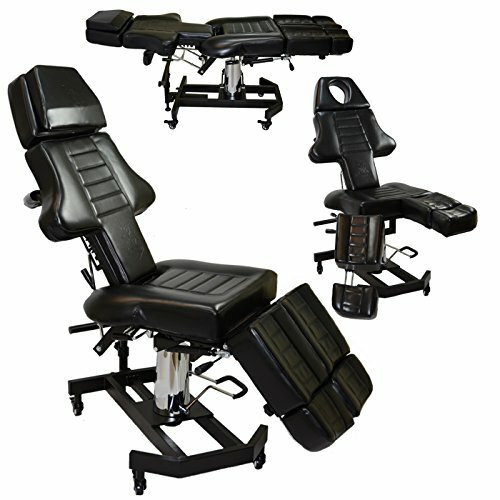 Tattoo artists will appreciate the swing-out leg rests and swivel armrests that will give them the freedom to move where they need. We also liked the fact that it is a hydraulic lift chair. Aesthetically, it’s a good-looking product that says professional. The LCL Beauty Tattoo Package has just about everything you’ll need to get up and running fast. In addition to the table, it includes a chair for the artist, a utility tray, and a separate armrest. Versatility is also high on its list of features that speak to its value. The table is a generous 24 ½ inches wide. It has an extendable headrest to take it to 78” long. We liked these details that will make the tattooing experience more pleasurable for both the client and the artist. You can remove the arms and pillows to create the optimal space to work. We were impressed with the fact that it has 4” high-density foam padding. It’ll increase its durability and support. When someone is on the table, we want them to feel comfy and at ease above all else. The extra cushioning is also welcomed by the artist. Buying a tattoo chair is an important decision. For one, it can be a big investment. And budget is probably one of your primary concerns. But it’s also about buying a chair that lasts. For an artist, it’s like an easel. You should be comfortable with it. You don’t need to waste time adjusting. Solid construction is essential. It’ll put both you and your clients at ease so that you can focus on the important things—the art. Your tattoo chair also sends a message. Customers will notice if you use high-quality equipment. The investment will help solidify your reputation with clients. First, consider the tattooing experience from the client’s point-of-view by thinking of your experiences. Sitting for a long session isn’t the best part of getting a tattoo. If it’s a larger design or one that is more intricate, it’ll add up to a lot of downtime for the client. You want to make that experience as comfortable as possible for your customers. Remember that’s all part of the experience. And you want those repeat clients and referrals, right? Comfort takes many forms that you need to consider when buying a tattoo chair. A chair that has adjustable features will go a long way toward making it a good client experience. Consider extra features such as an adjustable arm and a footrest. A seat that you can adjust is another great feature that will make it easier for you to work and the client to go through the process. Also, think about the type of work you typically handle as well as your client base. That is where you need to focus. A tattoo chair that is versatile will make your job that much easier. When looking at chairs, make sure and check what is included and what is going to cost you in extras. Versatility also comes into play with fitting the chair to the client. Look for chairs that allow you to adjust for height and body size. Many chairs have features like expandable headrests, so you accommodate taller individuals. You should consider yourself too. If you’re not comfortable doing your work, it’ll show. You’ll know it, and the client will know it. Take time to think what would make your world ideal since it’s just as physically demanding for you too. If you’ve worked long enough, you’ll know the specific needs. Features like removable armrests can give you more space to work and create. And clients come in all sizes and shapes. Your tattoo chair should accommodate anyone coming into your shop. And again, check to see what’s included and available for the chair you choose. 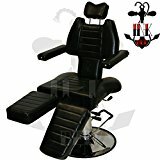 You may want to consider a hydraulic tattoo chair or at least a reclining tattoo chair if your space and budget allows. It’ll help you stay focused on your work without the interruptions of making constant adjustments. On the downside, a hydraulic chair isn’t mobile. It’s a heavy piece of equipment that’ll stay put. Also, take the time to think about how you’ll work in the chair. Are there convenient places to rest your arms to keep your hand steady? Features that make your job easier with less fatigue are worth considering. In the end, they will affect the quality of your work and your productivity. You should also consider things like ease of cleaning and resistance to staining. It’s all part of the presentation you’re making for that first impression. Look at the stitching on the seats and rests for solid construction that won’t tear or unravel because your chair will get lots of use, right? This video from the Ohio Tattoo Academy explains the process of setting up your tattoo station for optimal safety for both you and your clients. It’s all about preparing things ahead of time to work efficiently without interruptions. It also makes an excellent impression on clients. A common complaint about some tattoo chairs is a lack of stability. A low-quality product may wobble and appear unsteady. And heaven forbid, you recline it too far back. These aren’t just quality issues; they affect the safety of both you and your customers. You, of course want a chair to stay steady while doing your most intricate work. There’s no room for mistakes in the chair or on the table. It also lends peace of mind to your clients who may be a bit uncomfortable already. A model that wobbles is a distraction. When you look at a chair, look for balanced construction. It should look sturdy. You shouldn’t skimp on this equipment. Instead, think of it as an investment for providing an excellent service for your clients. Fortunately, you’ll find many excellent choices at several price points for any budget. You know your business. And you know what your typical workload entails. To get the most value for your money, you should pick a chair that ticks off as many boxes as possible. A tattoo chair isn’t cheap. Especially hydraulic tattoo chairs. The best investment is the one that can serve the most needs. Make it count. Are you now ready to purchase the right chair for your tattooing sessions? Hopefully, our buying guide and reviews above have highlighted what chairs are best for your specific style or tattooing, leaving you fully confident that you're spending your money on a quality model. Now all that's left is to get your client or whoever your inking sat down and get to work on them!